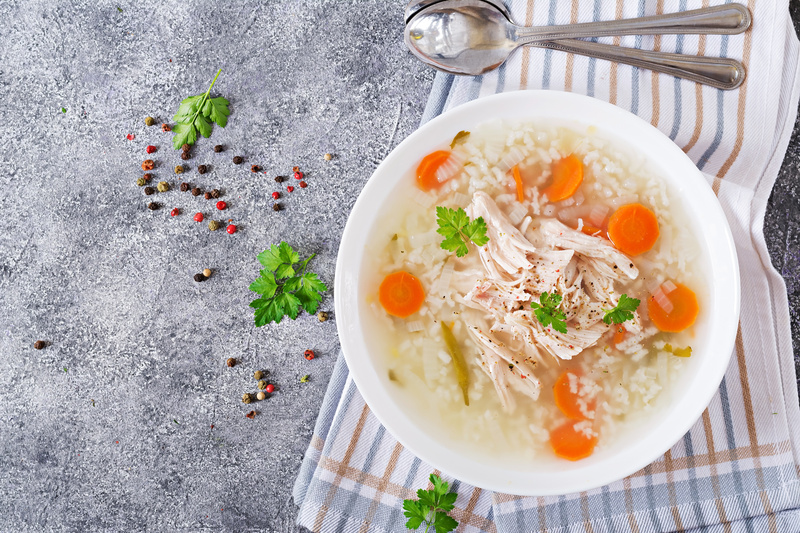 This is a perfect soup to have while the weather is cold! Enjoy. Heat oil in a large soup pot. Add the onion, carrot, and celery. Cook for 5-8 minutes, or until the vegetables begin to soften. Season with Himalayan salt and pepper (if desired) and stir in the thyme. Pour in the chicken stock and add the bay leaf. Bring to a boil, then reduce to a low simmer. Add the whole chicken breast. Cover and simmer 15 minutes, or until the chicken is cooked through. Remove the chicken from the pot and use two forks to separate it into shreds. Discard the bay leaf. Return the shredded chicken to the pot, along with the cauliflower rice. Simmer 5 minutes, until the cauliflower is cooked. Stir in the coconut milk and parsley and cook until warmed through. Season with salt and pepper to taste. 7 Signs of a Hormone Imbalance: Could Your Hormones Be Off? Copyright © 2014 Dr. Thaddeus Gala, DC. All rights Reserved.